Some things you just can’t prevent. For example, heavy rains and flooding can and will cause foundation problems. Weather isn’t something you can control. On the other hand, there are a few things that you can do as a home owner to at least direct the flow of those rains to potentially help save your foundation. 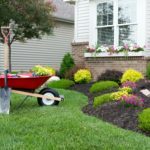 While there are other factors at play, such as yard drainage and interior drainage, these three things are somewhat easy for you to monitor as a homeowner that can help prevent foundation problems. Gutters: by keeping gutters in good repair and free of debris you can keep water from flowing over the tops of the gutters to the ground right around your foundation. Gutters direct water aware from walls and windows, doors and your foundation as well. You should clean your gutters several times a year, and replace them if you notice cracks or splits or if you notice pools or water or mildew near your foundation. Check for water damage marks directly below the gutters as well. 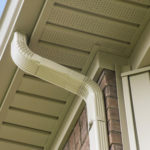 Downspouts: by making sure you have these connected and working properly they can direct the flow of water down and away from your foundation to the street. Downspouts are similar to gutters in that if you notice cracking or splitting, denting or rust it may be time to consider replacing those downspouts. 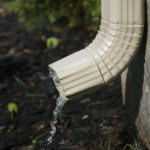 Make sure downspouts move water away from the foundation with proper drainage. Many of our contractors can assist in this area if you need help! Grading around your home: If the grading starts out higher around your foundation and moves down and away from your home this can also help. Grading is something you can likely do yourself but if you have concerns about grading or the foundation you should contact one of our foundation contractors for help. If you notice chipping, spalling of concrete or cracks in the foundation grading isn’t going to help and you need professional assistance. These are three simple things you can monitor as a homeowner. Leave the drainage, basement or crawlspace waterproofing, and foundation repairs to experts like our network of certified contractors. Some jobs aren’t DIY jobs. But just by monitoring and staying on top of the three factors above you will be taking steps to prevent even worse foundation problems. It’s the season for rain, so now is the time to be on top of it! Contact us if you have any concerns about your foundation. We are here to help.